A Greater Houlton Christian Academy student outspelled his northern Maine peers during 38 rounds of competition to win the Aroostook County Spelling Bee at the University of Maine at Fort Kent Fox Auditorium on Thursday, Feb. 7. 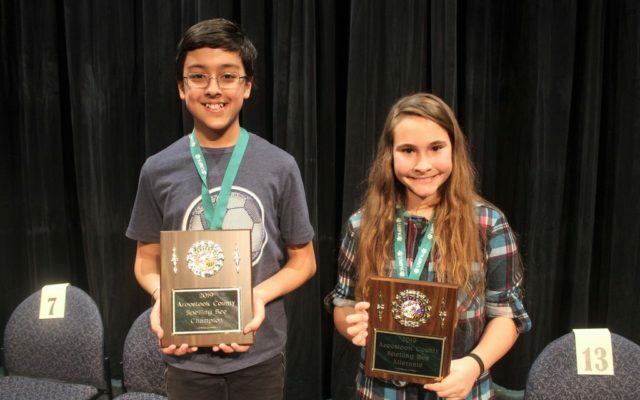 FORT KENT, Maine — A Greater Houlton Christian Academy student outspelled his northern Maine peers during 38 rounds of competition to win the Aroostook County Spelling Bee at the University of Maine at Fort Kent Fox Auditorium on Thursday, Feb. 7. UMFK and SAD 27 hosted the event which included a dozen stellar spellers in grades 5-8 representing schools from Fort Kent, Easton, Frenchville, St. Agatha, Houlton, Madawaska, Mill Pond and Woodland. Bee pronouncer Aaron Bernstein challenged the students with words such as “phaeton,” “rivulets,” “valise” and “offal,” which had many adults in the audience questioning their own vocabularies. Singh Ranger, 12, said he studied a list of potential words in order to prepare for the Bee, but had some reservations when facing the words “etch” and “munificent.” However, he managed to sound the words out and come up with the correct spelling. Sheena Singh Ranger said she was nervous watching her son compete in the Aroostook County Spelling Bee, but had confidence in his ability. “He loves reading. He loves Harry Potter and that helped him out a lot I think,” she said. Sofia Birden, Shannon Lugdon and Calvin Thomas Johnson were judges at the 2019 Aroostook County Spelling Bee. Vir Singh Ranger will move on to compete in the Maine State Spelling Bee on Saturday, March 23, at the University of Southern Maine in Portland. He said he plans to prepare for the state championship by studying the dictionary. If he is unable to participate in the event, Martin, whose parents are Gina and Andy Martin, will take his place.